Escape to paradise. Sink your toes into soft white sand that’s always cool to the touch and listen to the murmur of the waves. Start the day with a swim in the pool, work out in the gym or sign up for tennis and sail boating. The Royal Caribbean® offers plenty of activities for families and friends and after a busy morning, guests can visit the spa services for a selection of relaxing massages and therapies. Dine on fresh seafood or timeless Italian classics. Experience attentive service that will make guests vacation exceptional. Spacious rooms and suites, a wide range of resort amenities and activities for all ages and spectacular views of the Caribbean make this beachfront resort a favorite, with families and friends looking for an unforgettable Mexican Caribbean vacation spot. Guests at The Royal Caribbean can relax on the beach or enjoy a variety of activities, play tennis, try their hand at sail boating and book water sports and tours. 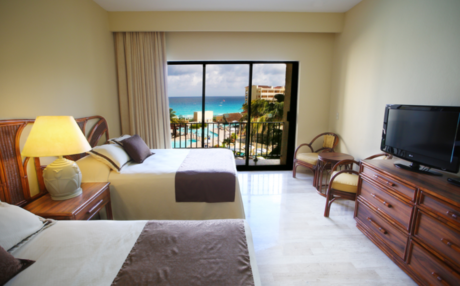 The resort is in Cancun’s famous Hotel Zone and guests can use the amenities at all two clubs. Amenities include pools, a gym and a golf program with discounted rates at several local courses. Water sports can be arranged at the Royal Marina next to Captain’s Cove restaurant on the shores of Nichupte Lagoon. The Royal Caribbean gym has the latest cardiovascular and weights machines. For dining at The Royal Caribbean offers International and Italian favorites and there is a convenient take-out counter. There are theme nights and cookouts during the week. Other services at The Royal Caribbean include a mini-market, gift shop and jewelry store. Tradewinds Restaurant: Italian and International cuisine for breakfast, lunch and dinner in a serene ambiance. 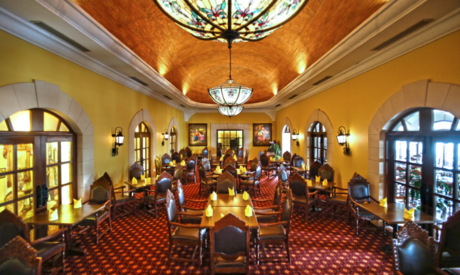 El Conquistador Restaurant: Located 5 minutes from the resort, serves seafood and international dishes. Captain’s Cove: In a colonial Old Mexico ambiance, the restaurant offers traditional Mexican dishes, seafood, steaks and fajitas. Enjoy mariachi live music and Mexican shows over the week. Located 5 minute by bus from The Royal Caribbean. Pancho & Willy’s Bar: A lively ambiance is just a walk from CAPTAIN’S COVE. Perfect for drinks after your dinner. Hacienda Sisal: In a colonial Old Mexico ambiance, the restaurant offers traditional Mexican dishes, seafood, steaks and fajitas. Enjoy mariachi live music and Mexican shows over the week. Located 5 minute by bus from The Royal Caribbean. Paco’s Tacos: Only 5-minute walk to delight with some fajitas, tacos and other Tex-Mex dishes. Cayo Largo: A chill out vibe to savor delicious seafood and international dishes. Located 5 minute walk at neighbor resort The Royal Islander. Tradewinds Express Food to Go: Order roast chicken, ribs, salads and the sweetest treats and stay at your own private haven. La Cabaña Lobby Bar: A popular meeting place for friends and watching your favorite sports events, concerts and more. La Cabaña Lobby Bar also hosts karaoke nights during the week. Don't miss it! Royal Roast Coffee Co.: All you need is love and coffee and there is nothing better than a morning cup or at any time you please. For children aged between 4 and 12 years. If you would like to spend a morning at the Spa, on the golf course or just relaxing, take them to the Kids Club where they will make new friends as they enjoy supervised games, crafts, sports and more (additional fee for certain crafts may apply). Please note that for guests’ stays crossing a Saturday night might need to change rooms. Should this be the case, The Royal Caribbean will assist guests in order to make this an uneventful process. 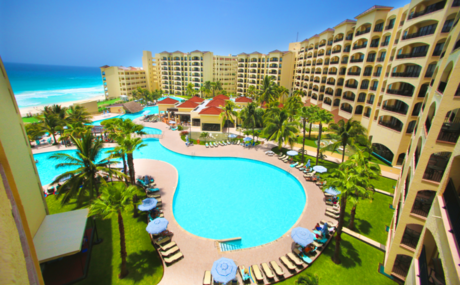 The Royal Caribbean All Suites Resort Cancun is an ideal Cancun lodging choice for your trip to Mexico. 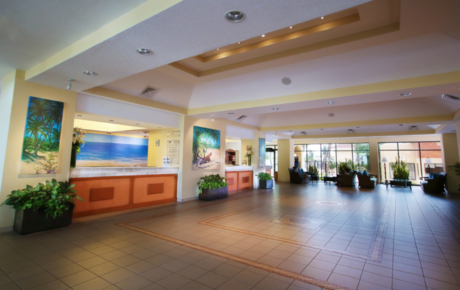 With numerous amenities for guests such as car rental, children's play area, beachfront, you will wake up at The Royal Caribbean All Suites Resort Cancun feeling excited every day for your time in Cancun. Don’t let this amazing reservation opportunity pass you by, book your stay at The Royal Caribbean All Suites Resort Cancun today to make the most of your time in Cancun, Mexico. Located in Cancun’s famous Hotel Zone.